In the summer the weather is hot (unless it isn't). Therefore the melting time of the wax will be shorter. Also the setting time will be longer. Once you have put the wax in your nose please wait at least 3 minutes before pulling it out! ALSO Do not heat at more than 500W in the microwave... unless it is being stubborn and won't melt, then go for it. Basically all microwaves are different and if your microwave is a sniveling weakling then please don't take it out on us. Patience is a virtue! It takes a little time to get used to using Kenashii. 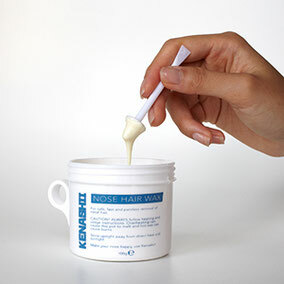 You may have used other hair removal kits in the past and we know change is scary, don't worry, Kenashii is different but it works 10000% brilliantly once you've gotten used to it. Perhaps EVEN BETTER than that old rubbish you've been using. It also takes practice to get the right amount of wax on the stick and apply and remove the applicator. Don't worry, you got this, and we're here to cheer you on. Soon you'll be a fearsome nose waxing ninja and everyone will respect your waxing prowess... probably. NOTE: All microwaves differ! Heating times will vary. Patience is a virtue and if you have any problems please just get in touch. 1.1 Remove the lid of the wax pot. Place in microwave off center as shown. Heat at 500W for TWO MINUTES and then check the consistency. Repeat this process, heating the wax for ONE MINUTE intervals until the wax reaches the correct consistency. 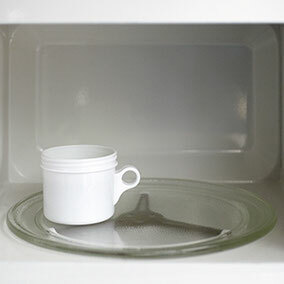 Wax should take approximately 3 - 5 minutes to heat to the correct consistency however all microwaves differ. 1.2 Leave the wax standing for 1 minute. CAUTION: Do not use your microwave on a more powerful setting that 500W, this can cause uneven heating and IN EXTREME CASES melt the pot. If the wax is very liquid or bubbling it has been over heated. CAUTION: Some microwaves have a very sensitive magnetron (particularly in the USA) and may struggle to heat the wax with no additional liquid in the oven. 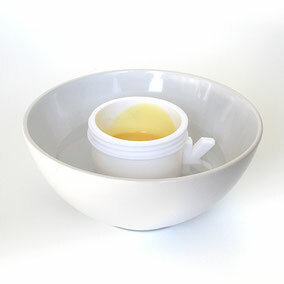 If you have any problems heating the wax with your microwave then place the wax in a bowl of water as shown (water should be about a third of the way up the side of the jar). Repeat the heating process as instructed in 1A. The water and bowl will of course become very hot. Make sure you take appropriate precautions when handling them. 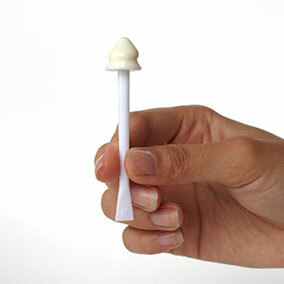 Test the consistency of the wax with the plastic wax applicator. The consistency should be like thick honey. If it is too liquid then it is still too hot. If the wax is the same consistency as pictured then test the temperature by placing a small amount of the wax on the inside of your wrist. If the temperature is comfortable to you, only then proceed to STEP 3. If it is too hot then wait until it has cooled down a little and then test it again. Nervous? Don’t be... you got this, we believe in you. Gather the right amount of wax on the end of the stick. This is the correct amount, no more no less. 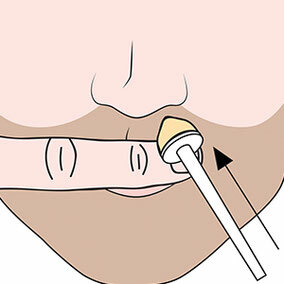 Hold your upper lip down with one finger and insert the wax covered stick into your nostril. Rotate the stick as you insert it to catch all the nose hairs. Be careful not to catch any facial hair - we’re here to help you with nose beard waxing, not beard beard waxing. Do not move the applicator once it has been inserted. Wait for 90 seconds while the wax sets. Contemplate the universe. 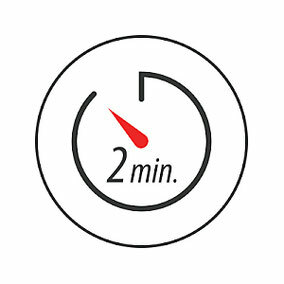 NOTE: Wait for at least 90 seconds. Any less than this may mean the wax is still too soft and some could be left in your nose. Our wax is specially designed not to become brittle and snap as it cools down. But we wouldn’t recommend leaving it for longer than three minutes, let’s face it you look a bit silly with those sticks up your nose and the fewer people see you the better. 6.1 Lightly pinch the sides of your nose and lift upwards. Grip the applicator stick firmly with the other hand and in one swift move pull down and out. The faster you pull the more effective the hair removal process will be. CAUTION: Don’t be timid, you’re a warrior king / queen with tiger blood flowing through your veins. Pull that stick out fast. If you don’t you risk pain and you might even cry like a baby, that would be embarrassing for everyone. 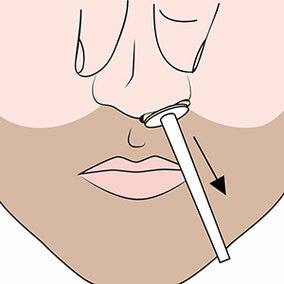 6.2 Repeat this process with the other nostril if you haven’t done so already. Tiger blood! Use the specially formulated luxury balm wipe to soothe your nose and help remove any wax residue. For external use only. Do not use inside the nostril. Welcome to your new, sexier, nose beard free life.